Almost 10 months ago, I purchased my first Mac. Because a lot more of my website work was less Microsoft and more Open Source, it made more sense. I also wanted to learn iPhone / iPad development which is impossible without a Mac. Was I going to be able to perform my normal job? Would it take long to learn OS X? Would I have to purchase a lot of software? Am I throwing my money away? By far, the biggest problem was the money. Everyone knows that Mac’s are expensive, and I wasn’t willing to spend $3,000 on a device I may land out hating. All my regular files could be backed up and easily transferred. The Mac can read standard Windows NTFS drives, and read and write to old FAT32 drives. I migrated all my email to a Google Apps account, so all my email was in the cloud and didn’t have to be transferred directly. This was a HUGE time saver. I followed Scott Hanselman’s advice on how to move my email without losing mail. I called Adobe and made sure I could transfer my Photoshop license to the Mac. Lastly, I went through every program I use, and found replacements for the Mac. As a developer, I need a more beefy machine than the average computer user. I had grown accustomed to a 17″ laptop, but because this was an experiment, I wasn’t going to spend money on that. I had to have a laptop, so that eliminated the iMac’s and the lower end Macbook. So, I definitely needed a Macbook Pro, but couldn’t afford to purchase one new. In short, it is looking in Los Angeles for a Macbook Pro, but asking it to not return any listings that mention “13.3”, “13”, “wanted”, “air”, “hp”, “jbl”, “trade” and “white”. I also specified to only see listings between $600 and $1400. This narrowed the results down enough for me to look through every day. I added it to my Google Reader so that I would receive notifications the instant one appeared. In under a week, I found a listing for a late 2008 model, just prior to the current Unibody model, with software and Applecare warranty for $1,000. I called and offered to come over immediately with $900 cash and he agreed. He was suprised I was willing to do this at 8 pm at night, but I knew if this mac wasn’t “too good to be true”, I would lose it by the next day. I didn’t know how to figure out if I was buying a good machine or not. I didn’t even know how to login to a Mac, or how to look at the processor. Luckily the seller’s roommate was able to answer my questions. The main place to look was in “About This Mac” which you access by clicking the Apple logo located in the upper left of the screen. 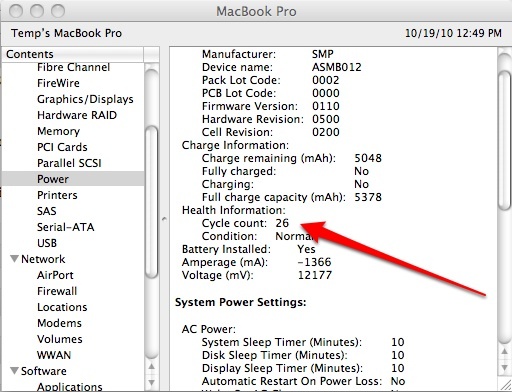 This showed me the processor and memory, and then when I clicked “More Info…”, I found the Battery Cycle Count which told me how many times it had been charged. This number was ridiculously low, confirming the story that he never used the laptop. He also said he had purchased a 3 year warranty from Apple, but I couldn’t confirm that there. I had his address, so I decided to buy it and go to the Apple store the next day, which did confirm the warranty. Lastly, the Mac came with a hard cover ($60 – $80), a bag, and software discs of Microsoft Office and Final Cut Pro. I found that many used Mac ads claim that it comes with lots of commercial software, but they rarely come with the discs – usually meaning that they are pirated. Having the original discs with license keys proved to me they were original. I sold Final Cut Pro on eBay for about $150, which I used to upgrade the RAM from 2 gigs to 4, and allowed me to purchase some additional software. With everything out the door, I got a 1 year old Macbook Pro with 2.5 Ghz Core 2 Duo with 4 Gigs of RAM, Microsoft Office, Bag, Case and a 2 year Applecare Warranty for about $800. It IS possible to buy a solid Macbook Pro for under $1,000 – I did it. You just have to have your wits about you and be aware of anything that smells shady. In my case, I got the seller talking and learned that he received the Macbook for the Film School he paid a lot of tuition to attend. He soon learned he didn’t want to be a Film Maker, and therefore never used the Mac. 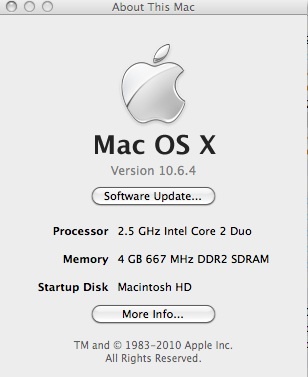 In the next part of Switching to the Mac, I will discuss learning OS X and the software I decided to buy.